My parents moved house recently, and I have the model railway which was sitting in their loft for a couple of decades back. 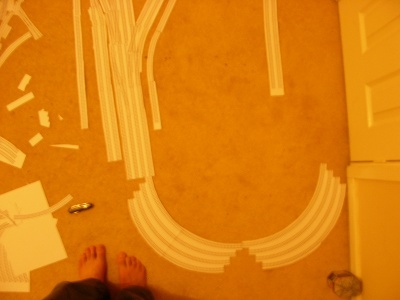 I'm building a new layout, so made some paper templates for planning the track. It was either that or clock making - I've been working away from home during the week for the last six months in Stafford, and I'm a bit tired of having all of work, social interaction and leisure mediated by computer, so wanted something to tinker with which wasn't software. I've also negotiated telecommuting so can sleep in our own bed every night. I'm quite impressed by the quality of modern models, and now DCC is available at N-gauge. I've joined the N gauge society and have been buying lots of tools, glue and paint. All my old trains, and the planned layout, are LMS, about half 1970s/1980s Graham Farish and Peco. I've fitted new profile wheels to the GraFar wagons which would fit on a 1930s layout so they don't look so toy-like, and have started making some kits from the N gauge society. The templates include switches. This word is a bit of a shibboleth. My family has LMS connections - my great-grandfather was an LMS drayman, and my father was a structural engineer in the ex-LMS region of BR (MR or midland region) in the '60s and '70s. So my dad always insisted I call them switches rather than points or turnouts. My grandfather George Kirkham was also a railman, becoming head of safety for Southern, and was responsible for the front of BR trains being high-visibility yellow among other improvements. He claimed that he just wanted a band across the top so track gangs could see them better, but had an argument with the graphic designer. They had a board with models of the fronts of the units, and he took the brush and slapped it across the top of one of the models. The paint ran down the front, so he just painted the whole thing and that's why BR trains went into service with the whole fronts yellow. My digs in Stafford are off Doxey road, next to the location of the LNER Stafford-Uttoxeter line. When I moved in I noticed that the names of the roads were all based on types of wood, so I did a bit of digging and had found out that the area used to be the site of Henry Venables Ltd.. The layout is based on the Castletown area of Stafford, at the junction of the main west coast line and two branches just north of Stafford station (though with some streets and buildings missing to squish it into 5 by 2½ feet). There was a joint LMS/LNE goods and coal depot on Doxey road (now Sainsbury's car park; the sign on the Castle Tavern opposite was replaced by a plastic one for a Greek restaurant on Thursday; I should have photographed it before it was destroyed), with a line over the river to Stafford gas works. The area around the junction had rail-served industries on three sides - Venables lumber yard in the V to the north (now housing, Henry Venables is now part of Venables Brothers which is based in Market Drayton instead), a grinding wheel factory to the west (still an abrasives factory) and Bagnall's engine works to the south (still called Castle Works, but a mix of light industrial units; it appears to be the same building though). I'm becoming a sort of anti train-spotter on my walks to work - seeing where trains used to be but aren't any more! The plan for the layout is to use Peco code 55 track in the scenic section, to which another three sides of an oval using of no-3 setrack curves will be added on demountable boards. Although I've spent some time drawing scale drawings, I find it easier to work at 1:1 scale for seeing whether it would work. I printed them on 300gsm card, which is probably a bit too heavy, especially for switches, slips and crossings - after a bit of playing I started printing these on paper so they could lie on top of the other track. The templates are available for download here, in case anyone else wants them. Dimensions are based on those Teladesign's old N-Scale pages, and by comparing the SVG with photos, so the switch dimensions are approximate - Peco don't supply dimensions without proof of purchase, and I don't know which switch to buy without planning, which requires having the dimensions of the switches. I also plan to create 'ghost' buildings using SVG and card for use until I populate the layout with proper models. Printing them was a bit awkward - they have a 200x252mm area to suit my printer and use millimetres as SVG dimensions. Google Chrome prints the whole thing about 5% too big. Firefox prints the correct size, but crops a centimetre or so in both directions. Inkscape prints the correct size, but crops about 5mm, and then prints a second blank page. OpenOffice.org Drawing won't display all parts of the SVG (Chrome is very lenient in what SVG it accepts). Importing them into Gimp works OK - import at 300 dpi and adjust the printer settings to ignore borders and scale it to the correct size (200mm width). Each sheet has a 100mm scale line on it to check that it is printed the correct size. I've had a squeezebox for about 14 months, about half of which time it hasn't worked. This was due to a combination of excito 'Bubba' (a small ARM based file server) not supporting upgrading their Debian installation without losing such things as power management, and squeezecentre being appalling bad at supporting old versions. I needed to upgrade the OS to use my backup drive - connecting a removable backup drive to a file server is a pretty major use case. As a result, I'm having to ditch the 'Bubba' as it's stuck on the old version. I'd forgot that .55 was already used in this network, so it wouldn't connect, so I don't know if setting the gateway is required for it to connect or not.